When leaders knocked on renters' doors in flood ravaged apartments near their churches, they heard story after story about eviction threats from landlords. Struggling to find work, and struggling to get to work without their cars, many renters said they just needed three weeks to get on their feet. Together, they initiated meetings with landlords from ten apartment complexes to press for a grace period. Many landlords refused. When Jacob Mireles returned home from deployment in Afghanistan and Kuwait last year, he quickly applied to Project QUEST for Rackspace's Open Cloud Academy cyber security track in Information Technology. During the training he ran into financial issues and Project QUEST assisted with a portion of the mortgage and utilities. He went on to successfully complete the program and soon after graduation, was hired by IP Secure where he now works as a Security Control Assessor, testing risks attributable to software and hardware systems. Eight months after their victory in reforming the state Industrial Tax Exemption Program (ITEP), leaders of Together Louisiana noticed that industrial tax exemptions spiked 441% in its last year (2016), with the majority of tax exemptions granted after the reforms passed. They additionally noticed that the Commerce and Industry Board reversed the wording of the measure to undermine the reform that would have limited exemptions to proposals that had secured the approval of the local municipalities sacrificing the revenue. With Louisiana as the state with the third highest number of poor people, many of them working full-time, Northern & Central Louisiana Interfaith leaders are devising new ways to tackle poverty. Says Pastor Clayton Moore, "If you work, how is it that you're poor?" NCLI leaders have launched Another Chance to Succeed (ACTS), modeling itself on Project QUEST in San Antonio and NOVA in Monroe, Louisiana. The goal is to train adults into higher wage jobs of at least $15 / hour. ACTS is targeting January 2017 as its start-up date. A 'crazy' idea from 70-year-old Betsy Smith amidst the lack of an automated federal response sparked the effort: "Rather than just donate money....donate $120 to pay an unemployed person $15 an hour for an 8-hour day's work helping with the cleanup effort." An economic impact study examined almost 400 people who graduated from JobPath in the last five years to track their progress. They found that the vast majority of people who graduated from JobPath still have a job five years later in the Tucson area, and that many have tripled or even quadrupled their pre-training wage. Said Applied Economics researcher Sarah Murley, "That is a huge increase over a relatively short period of time." JobPath was established by Pima County Interfaith as part of a multi-pronged living wage strategy. With over 400 graduated participants since 2010, Dallas Area Interfaith-established Skill Quest is making a name for itself through effective long-term job training. Says columnist Mercedes Olivera, Skill Quest is "doing its share to help reduce Dallas' poverty rate, one of the highest in the country." Clergy of Working Together Jackson stood with workers at a press conference organized in the wake of Kroger's announcement that it would close its South Jackson grocery store. 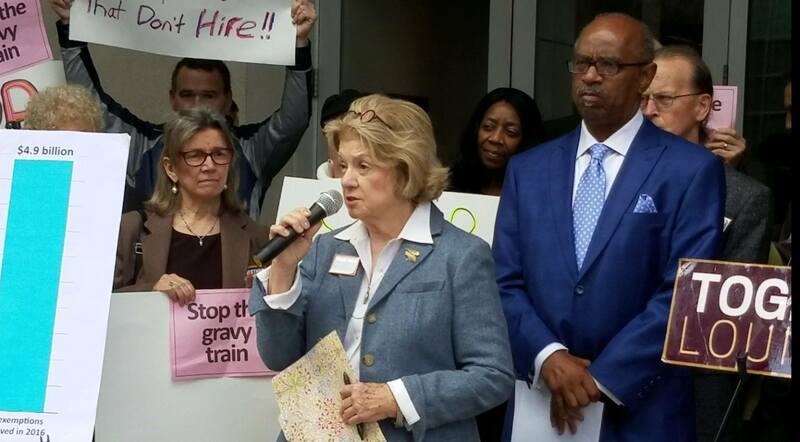 Clergy demanded the relocation of 109 otherwise unemployed workers to other stores, noninterference in local efforts to attract a new grocery store to this food desert and continued support for south Jackson public schools.